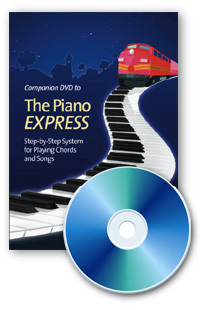 This Companion DVD to the Piano EXPRESS book and CD shows you HOW to do everything you hear on the Piano Express book and CD by watching my fingers do it. All tracks from the CD are demonstrated so you know where to put your hands and what your chords and melodies will look like as they are played on the piano. Accelerate the learning process so you can pick up any song from a fake book and be able to read it! Contains 10 tracks which coincide with the 10 chapters in The Piano EXPRESS. 1 hour and 10 minutes of lessons that can be played over and over again. Play on your computer, DVD player, ipod, or any mobile device.